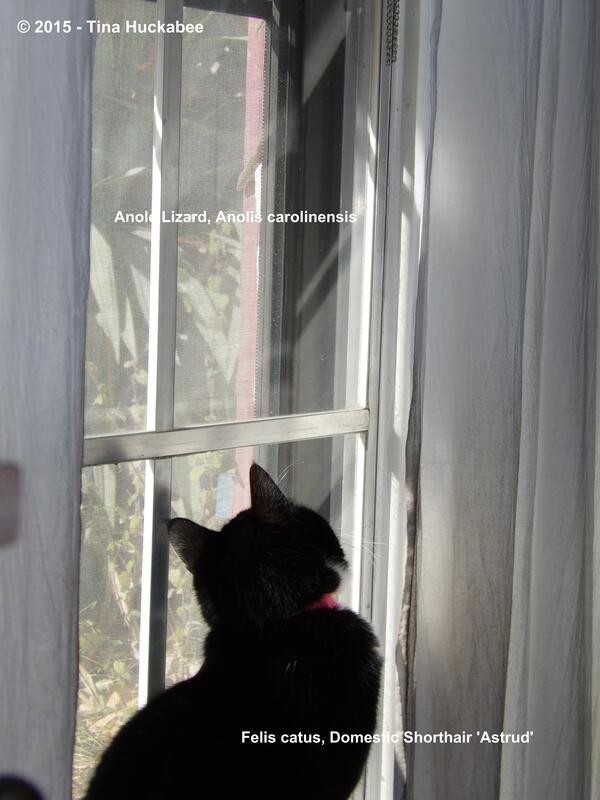 Astrud the Kitty would like very much to catch this green anole lizard who is safely just outside the reach of her claws. Alas, she cannot! She can only look and fantasize about this potentially tasty morsel. That’s just as well. Wildlife is better left observed and appreciated where they live. Please join Wildlife Wednesday, the first Wednesday of the month, February 4th. Photograph and write about wildlife you’ve enjoyed watching in your gardens, on hikes, or during vacations. Wildlife Wednesday, February 4, 2015. This entry was posted in Uncategorized, Wildlife Wednesday by Tina. Bookmark the permalink. In her mind she is a mighty hunter. Ha! Actually, she’s caught some small rats, which I won’t complain about–thank goodness, she’s not much of a birder. 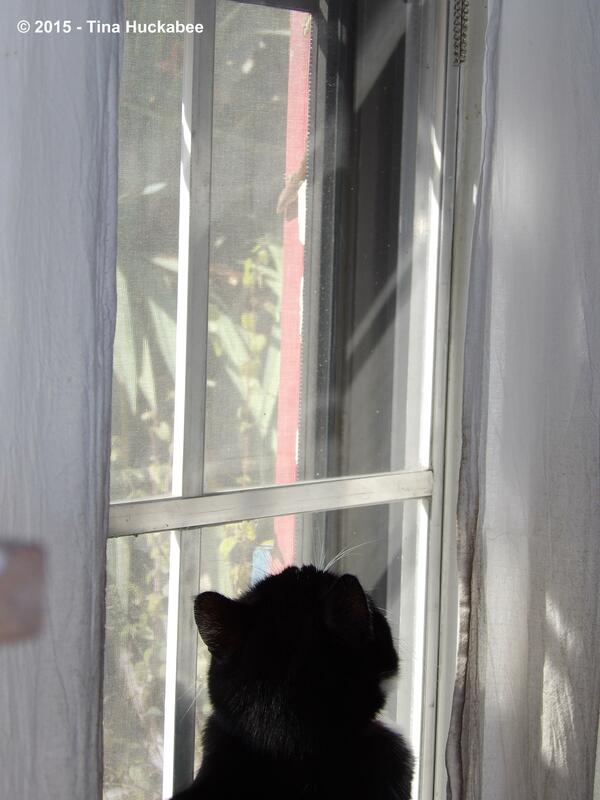 Our late cat Phoebe was more enthusiastic about hunting than we would have liked. We were fine with the mice and voles she caught, but not so much with the birds and baby rabbits. Our next cat, if there is one, will be an indoor cat for sure. Yeah, that cat catching bird thing is a problem for wildlife gardeners. My big, beautiful male, Nuri, is outdoors more than Astrud, but interestingly, also mostly catches rats and mice. It doesn’t happen often, though. I like these cute reminders! It’s been fun, Shirley and that’s what it’s about to me. Hope to “see” you Wednesday.